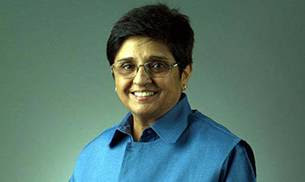 Kiran Bedi is the firs woman IPS (Indian Police Service) She is a retired Indian Police Service officer,Social Activist, Former Tennis Player and Politician who is current Leiutenant Governor of Punducherr. Now I'm going to give you a story. It's an Indian story about an Indian woman and her journey. Let me begin with my parents. when I was born in the '50s -- '50s and '60s didn't belong to girls in India. They belonged to boys. They belonged to boys who would join business and inherit business from parents, and girls would be dolled up to get married. My family, in my city, and almost in the country, was unique. We were four of us, not one,and fortunately no boys. We were four girls and no boys. And my parents were part of a landed property family. My father defied his own grandfather, almost to the point of disinheritance, because he decided to educate all four of us. He sent us to one of the best schools in the city and gave us the best education. As I've said, when we're born, we don't choose our parents, and when we go to school, we don't choose our school. Children don't choose a school. They just get the school which parents choose for them. So this is the foundation time which I got. I grew up like this, and so did my other three sisters. And my father used to say at that time, "I'm going to spread all my four daughters in four corners of the world." I don't know if he really meant [that], but it happened. I'm the only one who's left in India. One is a British, another is an American and the third is a Canadian. So we are four of us in four corners of the world. And since I said they're my role models, I followed two things which my father and mother gave me.One, they said, "Life is on an incline. You either go up, or you come down." And the second thing, which has stayed with me, which became my philosophy of life, which made all the difference, is: 100 things happen in your life, good or bad. Out of 100, 90 are your creation. I was conscious of the fact that what my parents were giving me was something unique. Because all of my best school friends were getting dolled upto get married with a lot of dowry, and here I was with a tennis racket and going to school and doing all kinds of extracurricular activities. I thought I must tell you this. Why I said this, is the background. This is what comes next. I joined the Indian Police Service as a tough woman, a woman with indefatigable stamina, because I used to run for my tennis titles, etc. But I joined the Indian Police Service, and then it was a new pattern of policing. For me the policing stood for power to correct,power to prevent and power to detect. This is something like a new definition ever given in policing in India -- the power to prevent. Because normally it was always said, power to detect, and that's it, or power to punish. But I decided no, it's a power to prevent, because that's what I learned when I was growing up. How do I prevent the 10 and never make it more than 10? So this was how it came into my service, and it was different from the men. I didn't want to make it different from the men, but it was different, because this was the way I was different. And I redefined policing concepts in India. I'm going to take you on two journeys, my policing journey and my prison journey. What you see, if you see the title called "PM's car held." This was the first time a prime minister of India was given a parking ticket. (Laughter) That's the first time in India, and I can tell you, that's the last time you're hearing about it. It'll never happen again in India, because now it was once and forever. And the rule was, because I was sensitive, I was compassionate, I was very sensitive to injustice, and I was very pro-justice. That's the reason, as a woman, I joined the Indian Police Service. I had other options, but I didn't choose them. So I'm going to move on. This is about tough policing, equal policing. Now I was known as "here's a woman that's not going to listen." So I was sent to all indiscriminate postings, postings which others would say no. I now went to a prison assignment as a police officer. Normally police officers don't want to do prison. They sent me to prison to lock me up, thinking, "Now there will be no cars and no VIPs to be given tickets to. Let's lock her up." Here I got a prison assignment. This was a prison assignment which was one big den of criminals. Obviously, it was. But 10,000 men, of which only 400 were women -- 10,000 -- 9,000 plus about 600 were men. Terrorists, rapists, burglars, gangsters --some of them I'd sent to jail as a police officer outside. And then how did I deal with them? The first day when I went in, I didn't know how to look at them. And I said, "Do you pray?" When I looked at the group, I said, "Do you pray?" They saw me as a young, short woman wearing a pathan suit. I said, "Do you pray?" And they didn't say anything. I said, "Do you pray? Do you want to pray?" They said, "Yes." I said, "All right, let's pray." I prayed for them, and things started to change. This is a visual of education inside the prison. That's the second landmark. I want to show you some moments of history in my journey, which probably you would never ever get to see anywhere in the world. One, the numbers you'll never get to see. Secondly, this concept. This was a meditation program inside the prison of over 1,000 prisoners.One thousand prisoners who sat in meditation. This was one of the most courageous steps I took as a prison governor. And this is what transformed. You want to know more about this, go and see this film, "Doing Time, Doing Vipassana." You will hear about it, and you will love it. And write to me on KiranBedi.com, and I'll respond to you. Let me show you the next slide. I took the same concept of mindfulness, because, why did I bring meditation into the Indian prison? Because crime is a product of a distorted mind. It was distortion of mind which needed to be addressed to control. Not by preaching, not by telling, not by reading, but by addressing your mind. I took the same thing to the police, because police, equally, were prisoners of their minds, and they felt as if it was "we" and "they," and that the people don't cooperate. This worked.